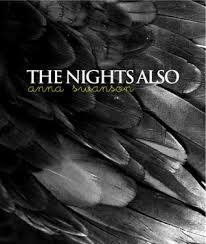 From my dedicated poetry shelf today’s selection, The Nights Also by Anna Swanson. Without judgment or censorship, shared here with you, random poem, “Lullaby for small” at page 15. After you’ve read this poem, I’d love to hear what you think about it, your reactions, what feelings or memories the piece evoked. What do I know of the world these days? and me, small enough to fit in a coat pocket. There is a box I keep on the table by my bed. which has disappeared into dark water. small enough to fit in a coat pocket. to carry me in. I swore I’d never get too big. sleep, baby, sleep. All the old songs. The falling notes like ripples. The pebble. The dark water closing around it. Cheryl, thank you for the thoughtful dedication, and for introducing me to this remarkable poet. Swanson’s work is both a comfort and an inspiration to me. So pleased you like her stuff, Diana!